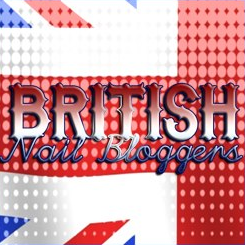 For this review of Nail HQ All In One I’ve only been testing the product for a couple of weeks. So I can’t yet say if it lives up to its claims (more of which below), but I can say that I do like it as a base coat. This is a blue-tinted base coat that is a multi-solution product for weak, soft and brittle nails. It paints on easily and leaves a slightly roughened texture to the nail, which is exactly what you want from a base coat so that the polish will adhere well to it. The blue tint doesn’t show up on the nail at all. All In One is made with acai berry, argan oil and “replenishing mineral complex”. That last bit is marketing speak for “chemicals”. I don’t mean to rubbish the product, but I do get angry about the marketing of health and beauty products, and with manufacturers who insist on making up product ingredients like this. After all, in my day job I am a marketing consultant, and I know how these sorts of product descriptions come about. Description aside, it is a nice base coat and one that I would definitely use again. Up until now I have been using Beauty UK’s base coat. This is the same price and I think is a superior product, so I fully intend to switch to using this. 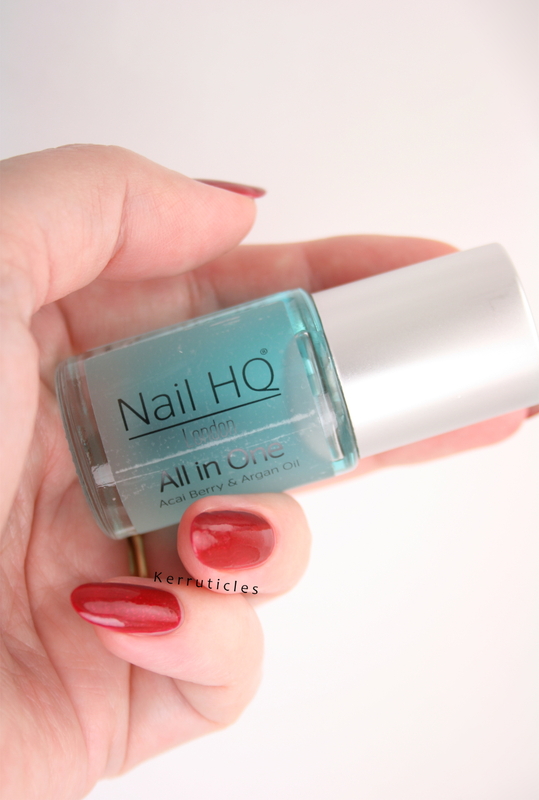 Nail HQ All In One is available on Amazon for £3.99 (currently) as an add-on item. So, to those claims. The formula is supposed to help prevent breakages in weak nails by hydrating the nail, strengthening it and helping to promote growth. The argan oil and the mineral complex help provide the moisture balance that is necessary for flexible nails, which in turn prevents brittleness and breakages. Now I haven’t had any breakages or splits or flaking since I’ve used it. But I have recently changed to a new nail shape, which I think helps with all that anyway. So it’s a little hard for me to objectively evaluate this claim. You can use this base coat on its own or under nail polish. The instructions say to wear it for 4-5 days and then remove and re-apply. 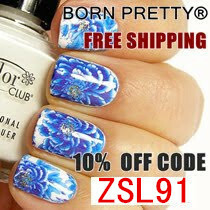 I have used the cuticle oil and really like it. I usually make my own cuticle oil, but bought some Nail HQ cuticle oil when I ran out recently. I have just this week finished up the bottle and can definitely recommend this Nail HQ product too. It is odourless, which I like. I am not always keen on the scents in cuticle oil – with the notable exception of Dadi’Oil – I can’t get enough of the smell of that! And the oil contains jojoba oil, which is very close in make-up to the body’s own natural moisturisers. Nail HQ All In One was sent to me for review. All views expressed in this post are my own, honest and unbiased opinions. Nice review on this base coat!